President Muhammadu Buhari has arrived Maiduguri to declare open the Chief of Army Staff Annual Conference holding in Borno State. The COAS conference was originally scheduled to hold in Edo State, however, it was moved to Borno state, in the wake of the attack on three military bases in Metele by Boko Haram terrorists. 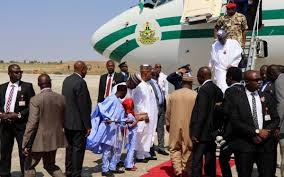 Bashir Ahmad, Buhari’s New Media aide shared photos of the president’s arrival at the Maiduguri International Airport.